Haughton Thornley Medical Centres wish to inform you that Margaret Rickson has sadly passed away. We would like to thank Margaret's family for giving us permission to ensure her experience and ideas live on so that others may continue to benefit from them too. Our thoughts and prayers are with her and her family at this very solemn time. Sadly, Margaret died on 1 September 2014 just before her 86th birthday. If you are reading this on the practice website www.htmc.co.uk then you can’t help but feel that you know Margaret personally. There are many videos, and links to her. Margaret was a wonderful person who worked hard for both the Practice and the patients of both Thornley House and Haughton vale. Thornley House PPG started in 2005 One of the first ‘accomplishments’ for Margaret was photos of the Practice staff in the waiting room. She felt this would enhance the patient experience and ‘put a face to the name’ before going in. Then Margaret’s ‘baby’ started. She put it to the meeting if we could have a Warfarin Clinic at the Surgery. In the end her persistence paid off. It took 2 years to achieve and it involved a doctor and nurse both having to have special training. There were a number of people who like her, were going to the hospital sometimes week after week and spending 2 hours there to get the test. This doesn’t include the time taken in getting to the hospital. For Margaret this meant a taxi to the hospital and if it was fine she could get the bus back. As she also suffered with COPD ( a long term breathing problem), if the weather was bad this meant getting another taxi home. Although it is possible to claim travel expenses, this doesn’t include taxis. Thanks to Dr Ahmed and the then Practice Nurse Vivienne Apannah who were willing to undertake training and along with the support from Dr Hannan over 90 people attended the Surgery Clinic and they all really appreciated this. This clinic is still in operation today and about 135 patients now attend. The PPG spent three years of fighting and persistence to have Hyde Pharmacy open next door to Thornley House and yes Margaret was very vocal on this point. As her health deteriorated Margaret took a back seat. She would attend PPG meeting and support where she could. Then of course there was Records Access that reinvented Margaret. The idea was good but at 76 she had never seen; let alone, touched a computer. She honestly thought Dr Hannan had lost the plot when he suggested she apply because she would greatly benefit. Later the same night she saw an advert that appeared in the Advertiser for a ‘computer course for the terrified’ at Hyde Library. Margaret joined the class and after 2 weeks decided she needed to buy a laptop of her own so she could keep practicing what she learnt. 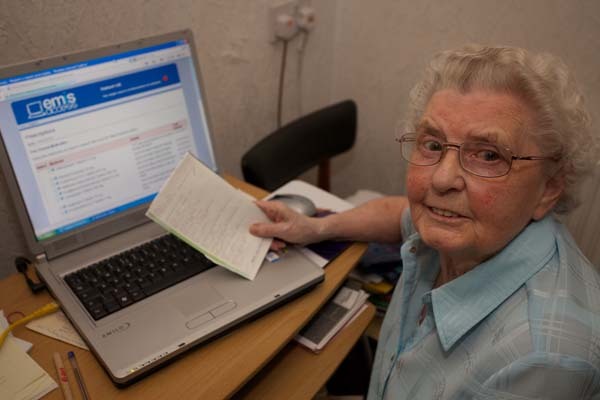 Margaret was very proud that she became the first patient to order her repeat prescription online at Haughton Thornley Medical Centres and continued to do so! Margaret was convinced this was the right thing for patients and spoke to many Consultants, Surgeons, Doctors and Politicians and nearly always received a standing ovation. She was also on TV and Radio programmes as well as being a ‘Front Page Cover Girl’ for Which magazine. Such a can-do approach has helped Margaret become a celebrity. She was mentioned by the new national director of patients and information, Tim Kelsey, at a US event that was attended by Hillary Clinton, the US secretary of State and wife of former president Bill Clinton. She was also shocked but delighted to be presented with an award and flowers from the PPG and the Practice for all the contributions she had made for the benefit of patients to the practice. Does Records Access work? A definite YES! Margaret attended a pre-op assessment. Her notes were missing and after waiting 2 hours she got fed up and told the nurse she had copies of her notes in her bag. Shocked the nurse completed her part of the assessment and then suggested to the Anaesthetist that he do the same. Having never seen anything like it before, he told Margaret they were inaccurate. Margaret responded ‘Now listen here love, it’s like this …… so once you understand it you know it’s not. Anything else you need to understand?" Gob-smacked all he could do was shake her hand and finish the assessment. So which came first the chicken or the egg? Margaret learnt to use a laptop to access her health records but then used Facebook to keep in touch with a grandson in the Army and follow a granddaughter on a 3 month holiday round Thailand. Whilst her health permitted she spent many hours on the Practice website and emailing friends around the world. 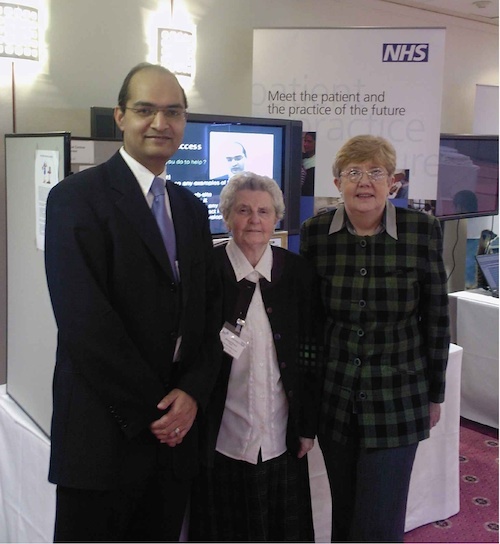 Margaret will be sadly missed but her legacy for patients will remain forever." "Margaret was an exceptional person. She got stuck in and carried on until it was sorted. She was a fighter who wanted the best for everybody"
"Margaret was an inspiration to me and others. She was a terrific example of how age doesn't matter if you keep involved, interested and open minded! If I'm half the woman Margaret was at her age, I will be very pleased! " "Over the last few years, I had the pleasure of spending time at PPG and other events with Mrs Rickson whilst we were developing this patient website with many contributions from patients, and I would like to offer my own condolences to Margaret's family and friends at this sad time. Margaret remains an inspiration to me and many others I'm sure, for the straightforward way that she communicated her own experiences of closer working with her Practice and for the fun and empathy that she brought along with her in whatever she did and in particular simplifying complex ideas, making them accessible for others. 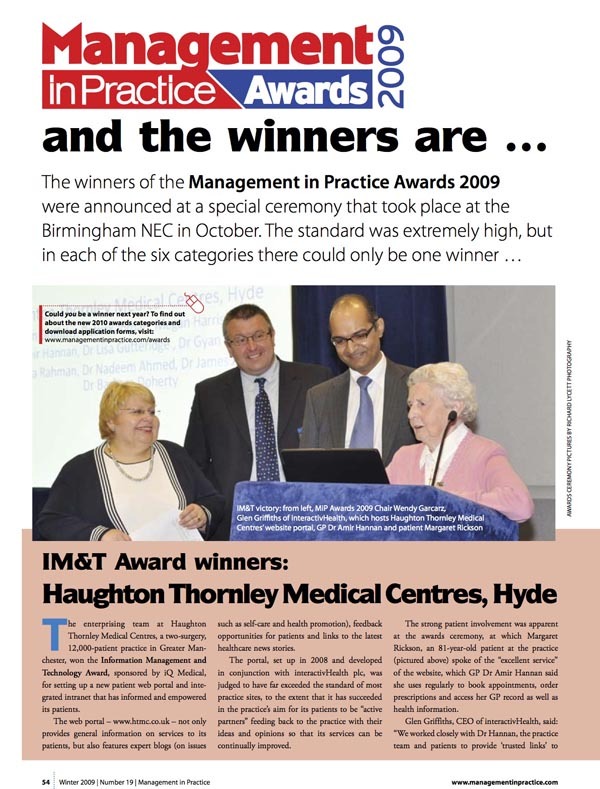 In 2009, Haughton Thornley Medical Centres won the Management in Practice award for Best use of IM&T, I attended the awards event at the NEC in Birmingham with Mrs Rickson and Dr Hannan (pictured below) and as ever Margaret was so compelling in what she had to say. Margaret was a friend and will be sorely missed". announces Margaret Rickson as one of the top 50 innovators in health today. But who exactly is Margaret Rickson? 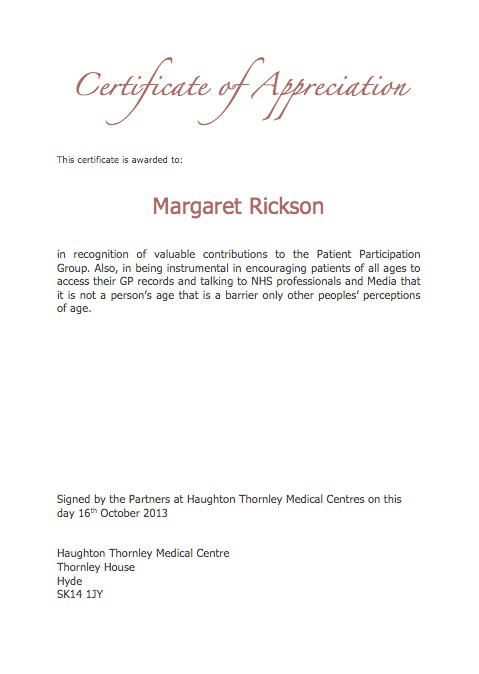 Margaret Rickson is a member of Haughton Thornley Medical Centres. 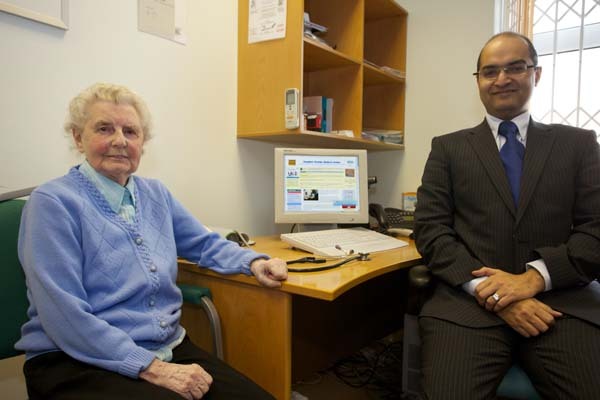 She was the first patient of the practice to order a repeat prescription online at the age of 77! Here is a photo of her in front of her laptop with her own medical record. 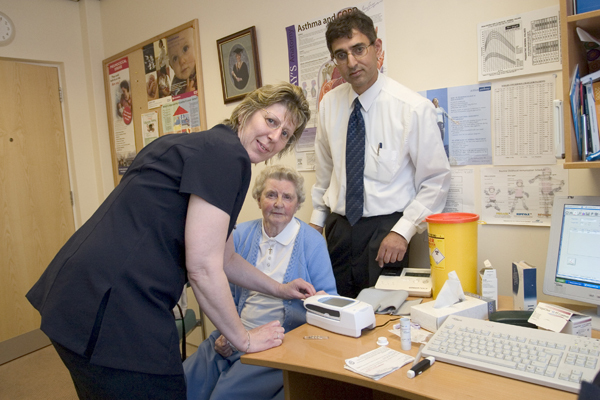 Margaret presented to GPs in 2007 at Tameside Hospital Postgraduate Centre her experience of ordering prescriptions online and how it makes her life easier for her. In 2007 Margaret was interviewed by Jane Dreaper for BBC News for an article "Web records prove hit with patients"
How I became an empowered patient and how you can too! 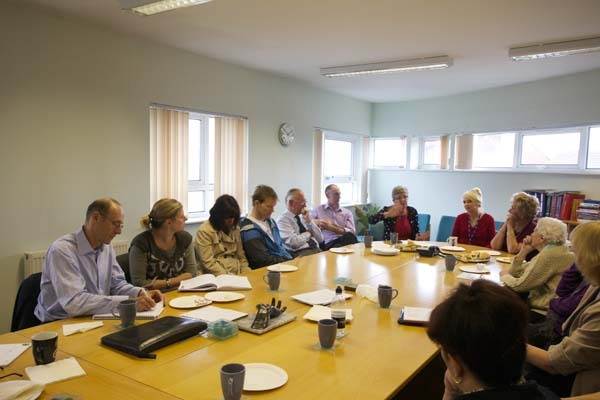 Margaret Rickson in 2008 describes to an audience in Haughton Thornley Medical Centres what patient access to records means to her and how others can do it too and then goes on to describe how she has benefited from being a member of the Patient Participation Group too. Margaret Rickson made a little cameo for patients and the public to see how easy it is to get access to her records and what the benefits are. She used to have to walk up a hill to get her prescriptions. This could sometimes cause her to have difficulty breathing because she has to take inhalers. But now she can easily order prescriptions online and then get the chemist to deliver it for her if she does not feel well. Margaret Rickson asked the practice to set up a warfarin clinic at the surgery so that patients could have their blood tests done in the surgery instead of having to go the hospital. Dr Ahmed ad Vivienne Appanah (practice nurse now left surgery) trained to deliver the service and now over 100 patients are benefiting. At the Citizens, Your Health, Your Health Data, Genomics and the Future conference in Glossop, Margaret describes her own life, how she was introduced to access her medical records and what it has meant for her. 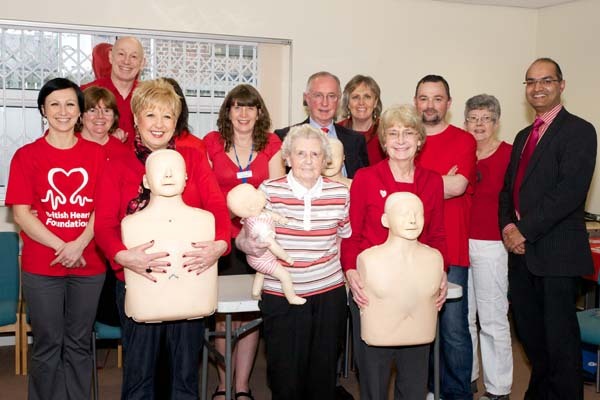 Margaret is always keen to learn new things and here's a picture of her with staff and other patients after learning about how to do CPR! Margaret was unable to attend a conference in Manchester due to ill-health but still wanted to address the audience. So she kindly made this short video including showing how she accesses her own records from home hoping it may spur others on to want to do the same! 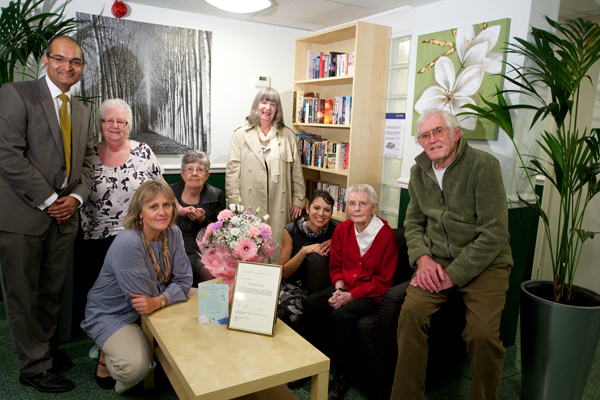 On 17th October 2013, Haughton Thornley Medical Centres visited Margaret Rickson to give her a Certificate of Appreciation for the tireless work she has done for patients and others in the NHS. You can see below (Left to right) Dr Amir Hannan, another friend of Margaret Rickson's, Dr Lisa Gutteridge (senior partner at Haughton Thornley Medical Centres), Yvonne Bennett (patient of Haughton Thornley Medical Centres), Marilyn Gollom (patient of Haughton Thornley Medical Centres), Wendy Smallwood (practice manager of Haughton Thornley Medical Centres), Margaret Rickson and Donald Hunter (ex Chair of Thornley House Patient Participation Group and a patient of Haughton Thornley Medical Centres). Click here to see how other patients are also benefiting from access to their records through testimonials they have written. Without all the help, dedication and work of all the patients, we are sure we would not have seen the benefits and been able to share them widely with the world. If you would like to know more then please email the surgery on htmcpatient@nhs.net.